Fenix Nutrition is a leading manufacturer of nutritional supplements. At Fenix Nutrition, integrity is the key to their success. Fenix believes in offering only the best ingredients in their products. Full label transparency is offered on all of Fenix's products so that their customers know exactly what ingredients, and how much of each, are going into their bodies. Each product is made in a pharmaceutical-grade, certified GMP facility. Their staff is dedicated to delivering the highest quality products and services in order to exceed customers' expectations. 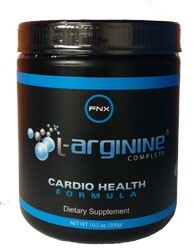 L-Arginine Complete is an all-natural cardiovascular health supplement for both men and women. The product manufacturer is Fenix Nutrition. It is based on a Nobel Prize winning breakthrough that many within the industry consider to be one of the most important advancements in the fight against cardiovascular disease in the last 50 years. L-Arginine Complete features 5000mg of l-arginine and 1000mg of l-citrulline per serving, the combination of which produces nitric oxide in the body for over 20 hours a day. Nitric oxide relaxes and expands the blood vessels and arteries which helps increase blood flow and improve circulation within the body. The added blood flow and circulation may assist in lowering high blood pressure, reducing the pain and numbness experienced by those with peripheral neuropathy, increasing libido and sexual desire/stamina and improving overall better health. The product also contains vitamins, folic acid, magnesium, chromium, resveratrol and astaxanthin. There are no proprietary blends in the product so you know exactly what you and your patients are consuming. Fenix Nutrition wholesale accounts always receive free shipping. The companyï¿½s products are manufactured in a GMP certified facility.